Mapmash has produced this time-line of the Mumbai terror attacks on Google Maps. The time-line is best viewed in the Mapplet (my Map) version on Google Maps own site but there is also a Google Gadget version, so you can add the map to your iGoogle page or embed it into any web page. Wikitude, a mobile travel guide for Android phones based on location-based Wikipedia content, allows users to view 350,000 world-wide points of interest on your phone. 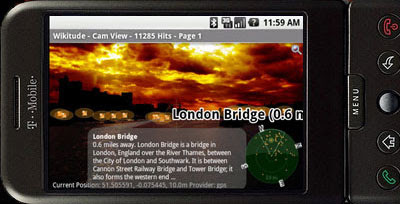 Using the AR view users can use their phone to look at the world around them and see the points of interest displayed as an overlay mapped on the phone's screen. I told you that you would be amazed. I've just added the 100th building (Buckingham Palace) to this Google Earth Browser collection of the best 3D models in Google Earth. You can now take a tour of eight cities Paris, Rome, Tokyo, London, Washington, Berlin, Beijing and Chicago. London is the latest city to have been added and this new collection includes, Buckingham Palace, the Tower of London and a number of other iconic buildings in the English capital. 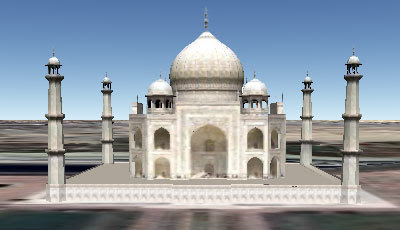 If you want to make your own collection of 3D buildings or natural wonders in the Google Earth Browser then go to EarthSwoop. EarthSwoop has a number of collections put together by its users, including this one of Man Made Travel Wonders. This collection of travel writer Howard Hillman's list of the world's greatest man made wonders includes the Great Wall of China, Machu Picchu, the Taj Mahal and many more. Both of the collections above require the Google Earth Browser plug-in and are Windows only. CabEasy.com allows taxi travellers to share cab rides. Those looking to share a taxi can create new cab rides on a Google Map or browse the map to find the ones that match their route. They can then contact a fellow traveller and arrange to meet. The service is very similar to the many car-pooling mash-ups built using the Google Maps API, only aimed at those who wish to share cabs rather than their own cars. Drijo - auction off available seats in your car or search for free seats in other people's cars. RoadSharing - car-pooling service that provides an easy way to find someone to share a trip with. 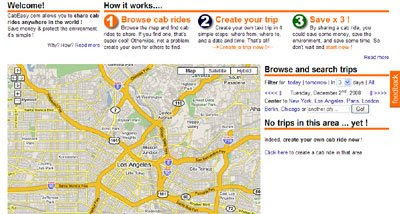 Cab4Me - Mobile service that shows your current location on a Google Map and attempts to find your nearest taxi provider. 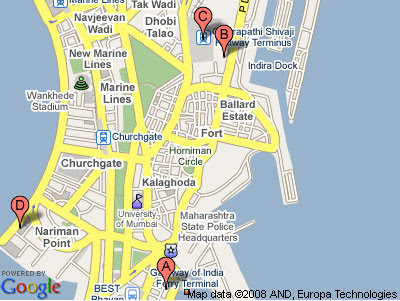 Mibazaar has produced a Google Map of geo-tagged YouTube videos of the Mumbai terror attacks. You can use the arrow keys at the top of the map to skip to the next or previous video. Mibazaar also produced this Mumbai Terror Attacks mash-up of YouTube videos, Google Maps and Twitter to help people keep abreast of the developing story. The map shows news reports that have been submitted to YouTube and also maps people's Tweets about the tragic events. Al Jazeera English has also been tracking the points of attack with the help of Google My Maps and Twitter users. Here is their Google My Map. A seventh foot has been found in a river in Canada. Each of the feet has been found by members of the public on a stretch of islands along British Columbia’s Strait of Georgia near the Fraser River. The feet have all been found in either hiking or running shoes. 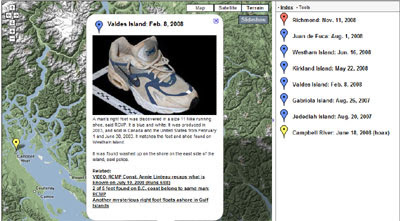 CBC British Columbia have produced this interactive Google Map showing the locations of where each of the seven feet were found. Each marker on the map contains links to the related news articles about the case on CBC. For some reason there is very little fun around this week. So I've decided for one week only to replace Google Maps Friday Fun with Phone Friday. Hopefully normal service will resume next week. When you send a message via Locatik it is possible to determine whether the message is public, for friends only or invisible (just for you). Locify provides a huge range of services for your mobile phone, all of them location based. It is possible to use Locify to browse points of interests, browse and record routes, view Google Maps on-line, show your position to friends via Google Maps (and most other on-line maps) and also access a huge range of third-party services. You can find Wikipedia articles about nearby places, track your movements and view your track later on Google Maps, find the nearest events and services and get a weather report. Check out the Locify website - there is a whole lot more. Brightkite is a location-based social network. You can use BrightKite to see where your friends are in real time and what they're up to. You can also use the service to meet like minded people near your location. With YouPosition.it you can create an on-line logbook of your trips, just by sending SMS text messages from your cell phone. With YouPosition.it if you include the coordinates of your position in a message the message will be displayed on a Google Map. Therefore your friends will know where you were when you sent the message. YouPosition.it is similar to micro-blogging sites like Twitter only here your messages are geo-coded and mapped. You can also upload a picture for each message that you send. And to celebrate Phone Friday (doesn't that sound so much nicer than Black Friday) I've added a new 'mobile phone' category to the Google Maps Directory. Al Jazeera have created a collaborative My Map of Mumbai. 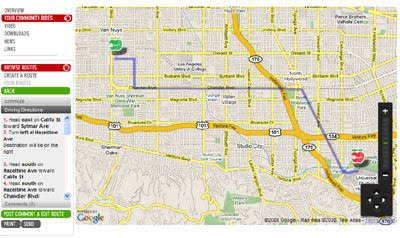 If you click on the Google Static map below it will take you to the My Map. Ten People are said to have been shot dead at Mumbai's main railway station. CNN say a 'hostage situation' occurred at Cama Hospital for women and children. Assailants hijacked a police vehicle here and fired indiscriminately at bystanders. Indian commandos have reportedly stormed the Taj Mahal hotel but the situation remains confused. CNN say that the Cafe Leopold, a popular hangout for Western tourists, was also targeted. More than six hours after the start of the attacks CNN were reporting fighting in the Colaba Market. Reportedly this police station was one of the locations attacked. Clicking on the Google Static Map above will take you to a My Map of the events. My apologies for any misplaced markers and thanks to Wikimapia which I used to find some of the locations. 29travels has created a great tool to create your very own personal travel map. Simple by ticking a few countries from a list you can get a short piece of code to show your friends where you have been in the world. Creating a personal travel map is very easy. First select a continent and then tick the countries you have visited. Next, choose the size of the map you want and the colour you want the countries to be shaded. Et voila ... you have your very own personal travel map. Once you embed the iframe in your own web page or blog you can show the world everywhere you have been. The embedded map shows the countries you have visited by shading them your chosen colour. Your embedded map also contains a drop down menu of the countries you have visited. Selecting a country you have visited from the menu will centre the map on that country. Where I've Been also lets you produce a map showing countries that you have visited. 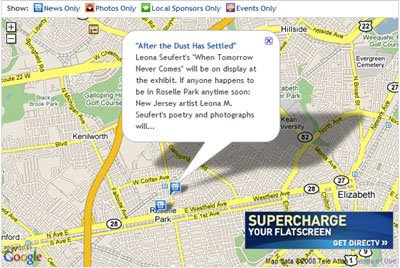 You can then show the map on your Facebook and MySpace accounts. To enter countries you have visited the site uses a Flash based map but when you change to city view the map changes to a Google Map. As you move the map around popular places nearby are listed. You can choose from the list or you can click directly on the map. When you add a marker you have a number of choices. You can choose between three options, 'I've been here', 'I want to go here' or 'I've lived here'. You can also add your own description. When a major news story breaks Twitter seems to have become many people's first port of call for breaking news and for trying to keep abreast of developments. YouTube is often the first place people look to find how the news organisations are covering the story and Google Maps is often referred to in order to give a story some geographical significance. Today in Mumbai, India, gunmen have carried out a series of co-ordinated attacks, killing at least 80 people and injuring 200 more. At least seven locations throughout the city seem to have been targeted. Mibazaar has quickly put together this mash-up of YouTube videos, Google Maps and Twitter to help people keep abreast of the developing story. The site shows news reports that have been submitted to YouTube and also maps people's Tweets about the tragic events. 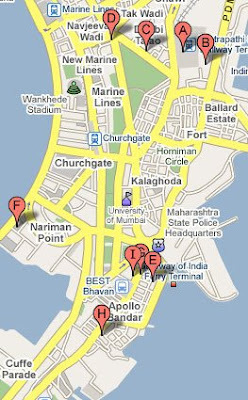 Clicking on the static map above will take you to this My Map of Mumbai. Google Maps in Taiwan now has Driving Directions, Public Transit directions and what looks like a new Google Maps feature - dynamic breadcumb links to districts. Clicking on one of the regions will pan and zoom the map to that region and then load links to districts in that region into the dynamic links box. Choosing a district pans and zooms the map to that district and then adds links to neighbourhoods into the dynamic links box. As you can see there are breadcrumb links at the top of the box so it is also possible to navigate back a level at any time. If you move the map around the links in the dynamic links box will change to reflect the current location. I haven't seen this before on Google Maps so I'm pretty sure it is a new feature. It's a pretty handy feature as well, so I wouldn't be surprised if the new feature starts popping up for other countries as well. Hat-tip to GMM reader Richy-Li for being the first to spot this new feature. Quite frankly there are not enough Turkey based (or should that be Turkey basting) Google Maps. Give thanks then for this Turkey facts Google Map mash-up. Did you know that there are three towns called Turkey in the USA and four named cranberry? Did you know that there are four towns in the US that claim to be the turkey capital of the world? (shurely that's Istanbul? (sorry I'll get my coat)). For more Turkey map fun check out the Turkey Day Facts Map. According to StateStats the residents of Utah have searched 'Thanksgiving' twice as much as any other state. And according to Spearman's rank correlation there is a strong correlation between searching for 'Thanksgiving' and searching for 'obesity'. StateStates is a site that analyses Google searches and uses the Google Chart API to generate static maps showing the amount each US state has searched for any term. Apparently Hawaiians are the least keen on turkey! I am currently sitting in front of my keyboard wearing a scarf, gloves and woolly hat. In most of Australia it is currently 28 degrees centigrade warmer than where I am sitting and Australians can actually consider going camping. They even have a Google Map mash-up showing them where they can camp for free. 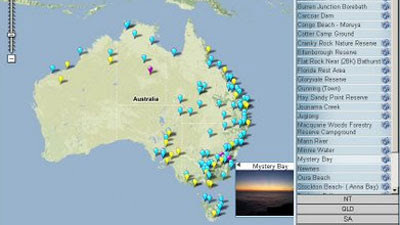 The Oz Camp is a community submitted map for Australian campers who enjoy free/independent camping. This map includes the new progress bar that animates as the map markers are loading. The site asks users to only submit places that they have stayed at (and for at least a couple of nights) to ensure that the descriptions of camp-sites are based on campers' personal experiences. Submitted camp-sites are shown on the map by colour coded markers (dogs allowed, no dogs allowed) and are also displayed in the map's sidebar. 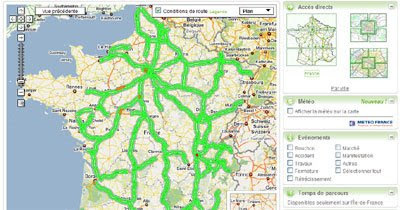 V-Trafic is an amazing Google Maps mash-up showing current traffic conditions for the whole of France. Motorways: APRR (société des Autoroutes Paris-Rhin-Rhône), AREA (société des Autoroutes Rhône-Alpes), ASF (Autoroutes du Sud de la France), ESCOTA (Société des Autoroutes Estérel, Côte d'Azur, Provence et Alpes), SANEF (Société des Autoroutes du Nord et de l'Est de la France) - SAPN (Société des Autoroutes Paris-Normandie) - ATMB (Autoroutes du Tunnel du Mont-Blanc), SFTRF (Société concessionnaire du Tunnel Alpin du Fréjus et de l'Autoroute de la Maurienne A43), Cofiroute. Urban: The city of Paris measures real-time traffic on its entire network. The system consists of electromagnetic loops buried in the pavement and measures the flow of vehicles. Taxi G7: Since 1996, a fleet of 4400 taxis have been equipped with satellite tracking to monitor the movement of each car. Analysis of the taxis' position with proprietary algorithms, enables the density of traffic to be calculated. National: - The CRICR (information collected on the ground by the police). Now that's a lot of sources, so I'm guessing V-Trafic's information is fairly accurate. The current conditions are shown on the map by coloured polylines. 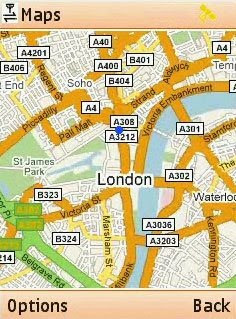 It is also possible to turn on and off a number of layers to see road works, accidents and events that may cause road closures / delays. As well as showing real-time traffic conditions V-Trafic can also show you the current weather conditions anywhere in France, Velib stations in Paris (bike rentals) and parking spaces in Paris. If you are living in France I recommend you bookmark this site now - you are going to be using this a lot! With the Montreal Sound Map you can listen to the sound of the stream on Queen Mary Street or the sound of the traffic on the Rue De l'Esplanade. 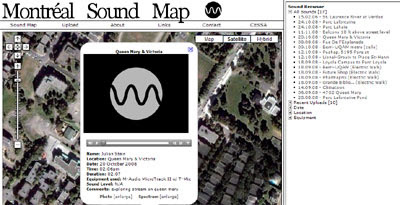 The aim of the Montréal Sound Map is to create a database archive of sound recordings from all over Montréal and anyone in Montreal can submit their own recordings. All the submissions are placed into a browsable tagging system based on the sound source, the location (borough, neighbourhood, municipality), the date (time of day, month, day of week, year, season), the environment (park, metro, indoors, outdoors, etc…) and the recording equipment used (recording device, microphone, etc…). All recordings are tagged on a Google Map and listed in the map sidebar. It is possible to listen to the sounds directly from the map marker. Google Maps has just undergone a major redesign of the user interface. The big changes are to the controls and to the way that Street View is displayed. In the picture on the right the new map control is shown (on the left) next to the old map control (on the right). The new map control now more closely resembles the Google Earth (and Google Earth Browser) tools. The Street View button has been replaced with a 'peg man' icon on the top of the zoom control. If you drag 'peg man' over the map and Street View is available the blue polylines will appear on the map and a small window will show the current Street View. If you drop 'peg man' on the map the Street View opens and takes over the whole map window. If you navigate via the Street View arrows your location is now shown in the small map in the bottom right of the screen. The 'report a concern' link is now at the bottom of the screen (before you had to press help before it appeared in the help information window). This should make it easier for anyone to report an inappropriate Street View image. A split screen view of half Street View and half map works particularly well with Google Maps Driving Directions. When you are in Driving Directions just click on the camera icon to go to the split screen view. Finally, when in the map view and you have zoomed in as far as it seems you can go if you press the plus button on the zoom control you will be taken to the Street View. I really like the new design. The number of buttons at the top right of the map screen was beginning to make Google Maps look a little clustered. Removing the Street View button from the top right helps give the map a cleaner look. Also making Google Maps more consistent with the design of Google Earth just makes sense (I wonder how long until a button for the Google Earth Browser view becomes available). The navigation of Street View is maybe a little less intuitive than it was before. This could be why Google have released this video explaining how to navigate Street View under the new design. Google have now posted about the update on the Google LatLong Blog. Some bright sparks have noticed the "Add a Map" link in the new Google Maps Directory, and have already added their maps. Using this link will not add your map directly into the directory. I want to avoid the directory being spammed so your map will only get added to the directory after I've checked that it really is a Google Maps mash-up. If you wish to submit a new Google Maps mashup to Google Maps Mania it is still best to send me an e-mail. In an e-mail you can actually describe your map in more detail. My e-mail address is given at the bottom of the right sidebar. 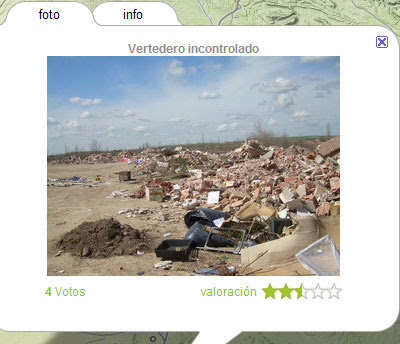 Fotodenucia GreenPeace is a photo-reporting Google Map mash-up for environmental blackspots in Spain. Anyone can submit their own photos to the site to highlight an area that they believe has been contaminated or may be about to be ruined by development. When viewing the photographs that others have submitted it is possible to filter the pictures by category. The categories include water, contamination, transgressions etc. The map also has a nice clustering system, so that when there are a number of markers in one location a green plus sign is shown. Rolling over that marker tells you how many submissions there are in each category at that location. Unfortunately my Russian is not as good as my Spanish so I can't tell you a lot about this Russian fishing map. 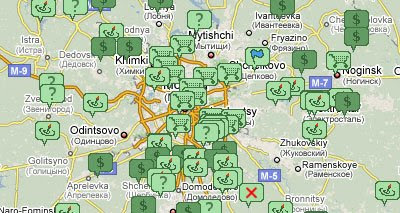 From the website's name I would guess that the map shows great locations to go fishing in Russia. Clicking on one of the tagged locations on the map opens an information window that contains a link. The link appears to take you to a page with more detailed information about that particular fishing spot. Also added to the Google Maps Directory was the previously reviewed eemap, a Chinese Google Map mashup that allows people to share their favourite locations. IGN entertainment, who last year brought us the GTA4 Liberty City Google Map mash-up, have now created a map for Fallout 3. IGN have imported map tiles from the game into the Google Maps API to create an interactive map of the Fallout 3 world. The map includes a large number of selectable layers organised into different categories; Points Of Interest, Ammo, Quests etc. Registered users of the site are able to add markers to the map by right clicking on the map. This should ensure that the map will become more and more detailed over time. Google have just launched Google Maps for South Korea. 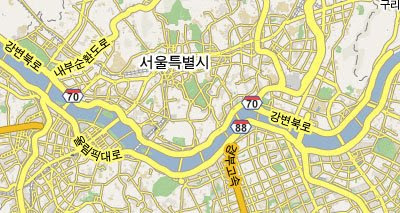 If you want to see Seoul (screenshot above) you will have to go to the Korean Google Maps site as Korean export restrictions on mapping data mean Google have to serve the road map tiles from Korean servers. The Korean map tiles have however been added to the Google Maps API. Mapperz has posted a good demonstration showing South Korea with the new road tiles and the Wikipedia and Panoramio layers turned on. My Korea - a map about Korean cities, transportation, parks, World Heritage Sites. Google Maps has added transit directions for Lisbon, Portugal. Google is working with Lisbon public transport providers CARRIS and Metropolitano de Lisboa to provide subway, train and bus directions in the Portuguese capital. Google have also announced two new libraries for Google Maps developers. The libraries have been developed by GeoStart, who offer geographical solutions based on Google Maps. The two new libraries are Progress Bar and Snap toRoute. Progress bar provides your map with a nice progress bar whilst your hundreds of markers are loading onto the map. Snap toRoute forces a marker to snap to the closest point on a polyline. Both of the two new libraries can be found in the gmaps utility library. Over the course of today Google Maps Mania has reviewed four excellent maps. Those four maps have been added to a new Google Maps Mania Directory of great Google Maps Mashups. I have taken what was the links list in the right hand column of this page and created a rudimentary directory of some of the great Google Maps that have been submitted to this blog over the years. At the moment the directory entries just feature a screenshot, a link and a category. I plan to add a brief overview of each map or a link to the Google Maps Mania review. But this process will take a long time. As will the process of weeding out the few dead links that the directory contains. Even in this rudimentary form I think that the directory is a great resource for anyone interested in Google Maps mashups. And if you want to create your own map it's always a great idea to browse through what others have already produced. If you are lucky enough to own a Vespa you can now share your favourite scooter rides on this community Google Maps mash-up. Vespa claim that if you own one of their scooters then your daily commute and your every trip to the store will become a memorable adventure. You can browse routes created from other Vespa owners directly from the mapped markers or from the list in the sidebar. When you select a route it is displayed on the map with a coloured polyline and the driving directions for the route are displayed in the sidebar. For me the only glaring omission on this map is the London to Brighton route. Up2Maps is a new Google Maps mashup designed to allow everyone to share their research data on-line. Anyone can use the map to add data about any country in the world and share this knowledge with the whole world. To add your data to the map you can type your data directly into a location or you can upload data from a spreadsheet. Once you have added data to the map you can then export the map to your own documents for presentations or you can view the data directly from Up2Maps. If you don't want to add your own data to the map you can just view the research data that others have already added. For example for France the uploaded data includes gasoline and diesel sales. Choosing either of these maps will take you to a map of France with sales broken down by region. The Up2Maps map itself has some really nice features. When you roll over a country a target appears to highlight which country you have selected. When you are viewing an individual country there is a 'level up' option that when selected zooms the map out to show a continent view, selecting 'level up' again takes you to a world view. You can also test drive the map before registering. I think this is a brilliant feature that all websites requiring registration should adopt. Let your users see what you offer before getting them to spend time filling in forms. 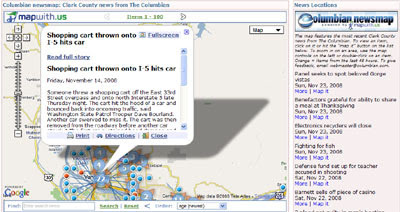 The Colombian, a newspaper in Clark County, Washington, has teamed up with MapWith.Us to create this online news map. At the moment The Columbian’s news map shows reports from the newspaper's own reporters and photographers, who are armed with smart phones to post reports from the field. However before the end of the year the newspaper will also have a separate map that accepts citizen journalist reports. The citizen journalism map will allow the newspaper's readers to instantly publish news that matters to them directly from their “smart” mobile telephones to the newspaper’s web site. The posted data will appear on the Google Map mash-up, automatically pinpointed to the correct location using the phones’ built-in GPS systems. Reader's submissions will be able to include photographs, text and even audio and video footage. It's great to see traditional newspaper embracing new technology and Web 2.0 philosophies to improve their news coverage. The first of some great Google Maps mash-ups today is this route planner from the Automobile Association in the UK which actually improves on Google's own driving directions. Like Google's driving directions the AA route planner shows the route of your journey via a coloured polyline on the map and also provides a detailed breakdown of the journey in a sidebar. It is in the detailed breakdown that the AA excels. First off, the AA site mirrors the colour coding of UK road signs. For example, in the screenshot above you can clearly see when you move from an A road onto a motorway and vice versa. 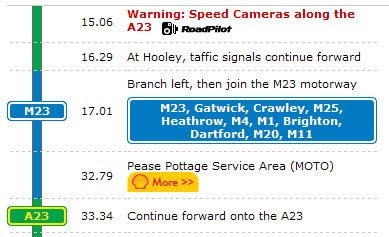 The AA route planner also includes traffic camera warnings in its directions and tells you when you will be passing a gas station, a hotel and or even an IKEA (just in case you need some Swedish flat-pack furniture on your journey). Like Google's own driving directions it is possible to click on any stage of the journey in the sidebar and the map will pan to that location. But even here the AA improves on Google's directions by opening an information window with a zoomed in map of that stage of the journey. When you use Google Maps to search for a local business you now have the option to 'translate reviews'. This is a really useful feature for those who like to use Google Maps when travelling abroad. For example, imagine you are in Rome and you want to do what the Romans do and visit a local Pizzeria. You can search for Pizzerias by choosing 'Businesses' from the 'Show search options'. Local Pizzerias will then be tagged on the map and be listed in the sidebar. At the top of the sidebar there is now an option to 'translate reviews'. 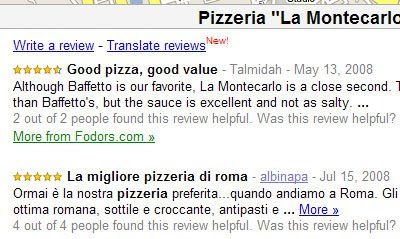 Selecting this option will magically translate the review from Italian to English. The 'Translate reviews' option also appears in the information window that opens when you click on one of the red map tags. 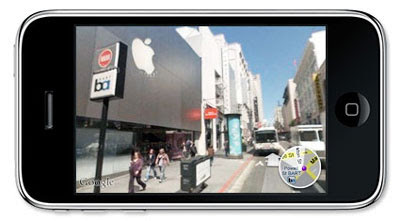 As widely reported the release of iPhone version 2.2 brings Street View to the iPhone. Version 2.2 also brings Google Transit and walking directions to the phone. These new additions mean that iPhone users can now use their phone to get directions and then check the Street View of their location just to ensure they are in the right place. Google Transit is available for more than 100 cities worldwide, including New York, Tokyo, Montréal, Zürich, and Perth. As new cities are added to Google Transit they will also be available to iPhone users. 360Cities.net's over 10,000 panoramic images for over 45 cities around the world has always been available via the site's own Google Maps mash-up. Now you can access the interactive panoramas in Google Earth as well. photography and VR photographers around the world. Now 360Cities.net can promote VR panoramas both via Google Maps and Google Earth. 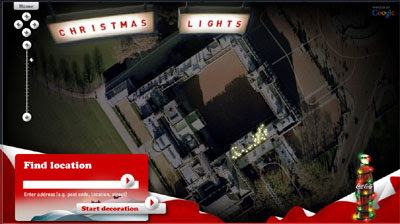 Coca Cola's Christmas marketing campaign allows you to decorate your house on Google Maps with Christmas lights. See how I've tastefully decorated my pied-à-terre in London in the screenshot above. Decorating your own house in this way is very easy. 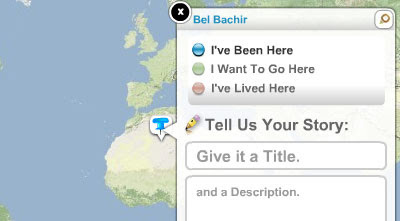 Enter your address in the search box and the map will centre on the satellite image of your home. You can then decorate your house with rope lights or choose from a number of pre-designed Christmas lights, like a reindeer, a star etc. Once you have saved your Christmas decorations Coca Cola will send you a link to your house that you can then send to family or friends. 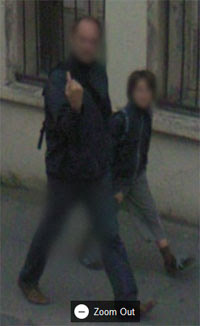 Google Sightseeing have been virtual tramping the streets of France again, where they uncovered this French dude signalling to the Street View car. With his kid in tow as well. Just for my own convenience I created this link list and list of Google Map Mania tags. Anyone with an interest in Google Map mash-ups can use this page to search through over a thousand maps. The page isn't particularly pretty but it does help me in searching through the Google Maps Mania archives. 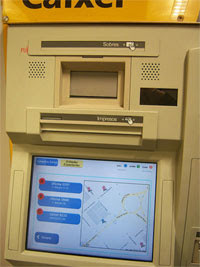 Martin Beijk discovered a Google Map on the screen of an ATM machine in Barcelona. The maps are being used by Spanish bank La Caixa to show the closest service centres of the bank. Martin explains more on his blog Local Search. The Google Map Maker team have put together a number of timelapse videos of cities as people have added map detail with Map Maker. Created by the NYU School of Medicine the Virtual Microscope uses the Google Maps API to display and navigate scanned slides of microscopic images. Students and faculty members who are logged into the school's Learning Management System can even add markers to the slides to annotate and comment on slide features. The site even comes with its own 'hot or not' feature which allows students to rate the slides (at the moment the most popular is a slide of the intestinal helminthic infection Trichuris trichiura - as if you hadn't guessed). The slides also come with a 'link-to-view' button which allows students to save or share links to a specific image, location within the slide and zoom level. There are currently 246 slides available for viewing. This is rather a topical map, what with the Sirius Star currently being held hostage off the coast of Somalia with $100m dollars of oil on board. 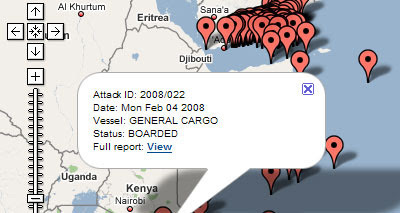 This Live Piracy Map 2008 by the International Chamber of Commerce purports to show all the piracy and armed robbery incidents reported to the IMB Piracy Reporting Centre during 2008. As you might expect there is a large cluster of incidents around Somalia but the biggest cluster seems to be off the coast of Yeman. As a rough guide it seems to me the closer you are to the equator the more likely you are to meet a pirate. 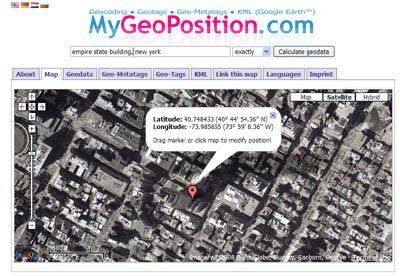 MyGeoPosition is a great application to help you geo-code a single address. From my limited testing it seems very accurate. As well as all these features the site returns a website url so it is possible to create a simple link to an address. If you don't want to link to MyGeoPosition, that's covered as well, as MyGeoPosition creates links to the location on Google Maps, Microsoft Live Local and Yahoo Maps. The site is available in English, German, Dutch and Bulgarian. New Zealand's 'Environment Canterbury' believe they are the first to create a Google Maps mash-up showing water quality in rivers, lakes and the sea. The mash-up takes water quality data from ECan's GIS system and integrates it with Google Maps to provide a dynamic method for accessing Canterbury's water quality information on-line. Swimming locations in the area are each tagged with a colour coded map marker (with a red marker warning you not to swim and blue markers representing very good water quality). It is possible to select a region of Canterbury from a link in the sidebar. When you click on a link the map zooms to that region and also loads links to swimming locations in that region into the sidebar. So if you are enjoying the New Zealand summer and you fancy a swim do your self a favour and check this map for clean waters before leaving home. Update: Ouseful was so inspired by this water quality map that he decided to create his own water quality map for the UK. He has a great article on his blog about how he created a map of UK Blue Beaches by using Yahoo Pipes to create a kml and then importing the kml into Google MyMaps to tidy up the geo-coding. Google have redesigned the Google Maps Case Study video website. 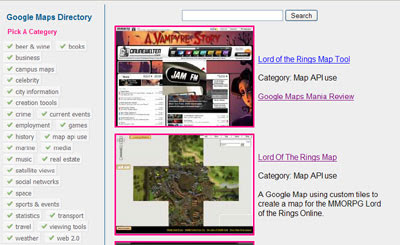 The site contains a number of video case studies of websites that use the Google Maps API. The site includes this video case study of Yelp. 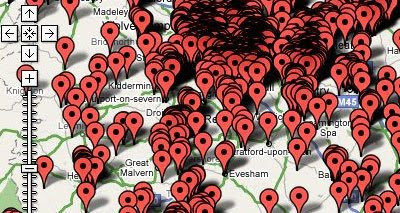 A UK map developer created a Google Maps mash-up showing the addresses of members of the British National Party (a neo-Nazi political organisation). He created the map from a leaked list of the BNP's members. "Many people have commented that the map does give a false impression of accuracy, despite my making this clear, and I'm tempted to agree. I do not want to single anybody out and by removing the accuracy from the map it is possible that it ends up incorrectly implying a property contains a BNP member. It has been suggested that an inaccurate map that doesn't make that clear is worse than publishing the list itself, and I think that's a reasonable comment." Spod.cx has therefore replaced the original Google Map with a non-Google heat map showing those areas in the UK with strong BNP support. It seems to me that most of the complainers to Spod.cx were happy that the BNP members addresses were revealed but less happy that the present inaccuracy of geo-coding could lead to cases of mistaken identity. UK TechCrunch has been following the story closely all day and has even managed to interview the map creator (by e-mail). It has also begun to identify some of the other mash-ups (LOLCats Nazis anyone) being created with the leaked BNP membership list. The story has also now made it onto the websites of most of the major newspapers in the UK. Australia's National Cannabis and Information Centre has put together a rather beautiful collage using the Google Map's API. 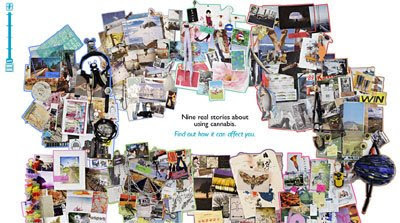 The collage contains nine real stories by young people telling their experience of using cannabis. The names of the nine narrators are linked at the top of the mapped collage. When you click on one of the names the map zooms in on that young person's part of the collage and an information window opens on top of the map containing the individual's story. As well as text outlining the individual's experiences with drugs a number of links are also given that attempt to answer any questions that the reader might have about the story and the drug experiences mentioned. This is an excellent example of how the Google Maps API can be used to present non-geographical information in an interesting and aesthetically pleasing manner. Topix is one of the largest news communities on the web, bringing together news from over 60,000 sources and categorising these stories into over 46,000 locations and 450,000 topics. It is now the third largest individual newspaper website (comScore, July 2008), attracting more than 6 million unique visitors. Topix uses Google Maps to show the location of news stories. News stories, photographs and local events are all shown on the map via different markers. Clicking on a news marker will open an information window containing a brief snippet of the news and a link to that story's own page. Topix uses Lat49's geo-contextual advertising to help monetize their content. iMap Weather is an outstanding new Flash Google Map weather service with ambitions to be the number one weather themed social network. iMap Weather currently provide some of the largest players in the mainstream media, including Fox, ABC, Gannett, Scripps-Howard and a whole host of local TV and Newspapers with their interactive weather map. Now they want to share this amazing weather map with you. One of the main ideas behind iMap Weather is that anyone with a website can install a really nice interactive weather map on their site quickly and easily by just cutting and pasting a few lines of code. The iMap Weather map uses the Flash Google Maps API to provide a weather map with an incredible number of features. 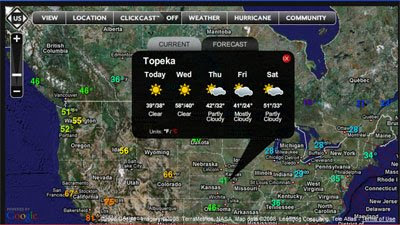 It is possible to view the weather and weather forecast for any location in the world. In the US you can view a nationwide radar image that is zoomable to street level! It is possible to view a hurricane forecast and to view buoy and ship data. iMap Weather also have strong plans for the future. For example, they will be introducing ski and snow conditions in conjunction with SnoCountry.com. At the moment temperatures are only shown in Fahrenheit but Celsius will be available in the next month or so. Radar is only available in the US at the moment, but will be available for Japan and Canada soon. Many other features will also soon be added such as wind and waves, etc. Probably iMap Weather's biggest plans however are in the area of social networking. On the horizon is a complete weather themed social network where members can upload photos, create mini-blogs, save customized maps, receive alerts, connect with other users and get all the weather information you need. Mashup Camp is under way in Mountain View, California. Tomorrow the winners of the Best Mashup Contest Awards should be announced. Hopefully we will be able to bring you news of the role Google Maps has played in any of the winning entries. Map developers in the UK, who couldn't get out to California, can console themselves by joining the new London Geo/Mobile Developers Meetup Group. There is still time to register for the group's first meeting next Thursday (27th November). I think this could be an Argentinian themed week on Google Maps Mania. Yesterday Google Maps introduced road maps in Argentina which should prove a spur to Argentinian Google Map developers. It certainly provided inspiration for Oh Buenos Aries who worked through last night to provide the first Google Maps mash-up (post road maps). 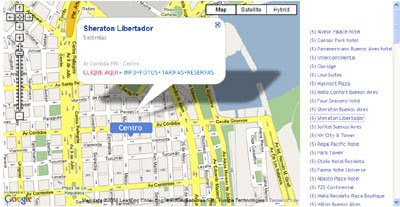 Hoteis Em Buenos Aires is a Google Map that shows hotels in the Argentinian capital. 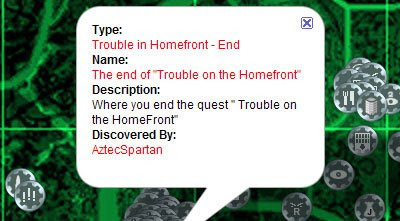 The hotels are all listed in a sidebar next to the map. Clicking on any of the hotels will open an information window containing a link to photographs and details of the chosen hotel. This week is Geography Awareness Week. During Geography Awareness Week National Geographic Magazine and other organisations try to raise the awareness of the importance of geography education. Noel Jenkins’ blog is all about using new technologies in the Geography curriculum. Neil is the winner of the UK's Royal Geographical Society Award for ‘Contributions to excellence in the teaching of Geography at secondary level'. So, as you might expect, his blog is full of inspirational ideas for the geography classroom. Noel is also the author of Juicy Geography. Juicy Geography has free ideas and resources for teaching geography. The site includes a great a lesson that gets students to describe places they know on Wikimapia and there are lots of lessons built around Google Earth files (which can of course be viewed in Google Maps as well). I particularly like the idea for a psycho-geography project. Noel's students found out from some questionnaire research that people in the local community were quite negative about their town, so his students made a simple sign and persuaded shop-keepers to display it. School Grounds Projects and a Sustainable Building project. This website displays the work of student geographers in the Soar Valley. These students used Google My Maps to map their worlds. Inspired by Google Lit Trips Tom Woodward mapped out Whirligig by Paul Fleischman on Google Maps to help inspire his students. This is a website for teachers and students to share and find information about educational topics that have been organised using Google Earth (hopefully you haven‘t forgotten that Google Earth files can also be viewed in Google Maps). All the resources are categorised by subject area. A blog about good design in Google Earth which includes a lesson plan showing the causes and effects of global warming on flooding in the Brahmaputra. Dale Basler has posted about how he teaches speed, velocity and displacement using Google Maps. The students use Google Maps to map out bus routes, find the average time needed for the bus to make a complete circuit of the route, calculate the average speed of the bus and display the results on a Google Map. KQED Quest uses Google Maps to present a multimedia series exploring Northern California science, environment and nature. The materials on this site are incredibly well presented. Teachers should also check out the Google Geo Education Section in the Google for Educators Discussion Group.